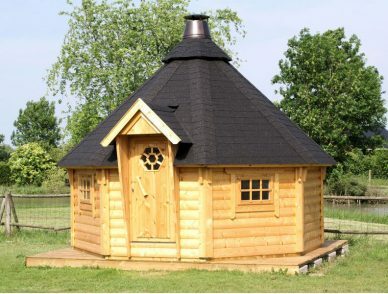 If you love to grill and BBQ during all times of the year, then a bbq hut is for you! Your yard will be a hit for BBQing not matter what the time of year or weather. Plan a party without worrying about whether or not it’ll rain. Invite friends over to try a delicious new recipe or have a nice, relaxing meal with your family. 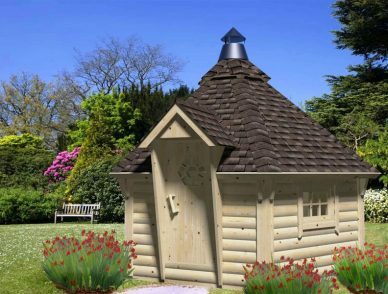 Our custom BBQ huts are an elegant addition to your backyard, garden, or whatever outdoor space you wish. Our huts are friendly for the environment, as trees are planted every time we cut down one for materials. Not only can you cook inside, as it is fitted with a grill and overhead hood for safety, but you can also pull up chairs and set the rounded table to enjoy dinner with family and friends. Our models range from 93 to 118 square feet, so no matter what size space you have, you will find a hut that works for you. Whether you are an avid BBQer or looking for a dinner space to retreat to in the cold months, a BBQ hut is a great idea to make your home and yard more dreamy.